Web strategist Jeremiah Owyang has been “on the grid” for over 900 days, and after a presentation to a Cisco partner conference in Honolulu yesterday, he began a much needed vacation. As he unplugged from the web, however, he spent the first hours of his time off plugging into the local geek community. I helped organize a “Blogger Dinner” to introduce local web heads to Jeremiah and each other, and we had a fantastic time. Jeremiah specifically sought an off-the-beaten-path experience, so we ventured out of urban Honolulu into the plantation town of Waipahu. (On our way to the event, in fact, we visited the Waipahu Soto Zen Taiyoji, my family’s Buddhist temple, which I suspect sees one tourist a year.) The mission was to find authentic Hawaiian food, and it doesn’t get much more authentic than at Highway Inn. Situated in an small and unassuming strip mall off the highway and a stone’s throw from the interstate, the eatery has been a local institution for over 60 years. The food, of course, was fantastic. Among us, I think every dish on the menu was served. Laulau, kalua pig, pipikaula, tripe stew, poke, lomi salmon, and poi, of course. Gadgets of all kinds were in abundance, ranging from the Flip Video camera to a Nokia N95. And the conversation flowed freely and widely, from kids and family to cutting-edge web services. Of course, Twitter was a hot topic, as the event was as much a Twitter meetup as it was a blogger gathering. Twitter was how most of us were connected, and how I’d spread the word of Jeremiah’s visit. We were a large group for the small restaurant, but fortunately Neenz and family warmed the staff up early. The manager remembered me and my blog entry about the restaurant’s 60th anniversary, and said it had brought some new customers. And our server, Mapuana (a.k.a. Malia), turned out to be an integral part of the evening. She was more than friendly and patient, she was completely fired up. Her tale of discovering MySpace had the group in stitches, and we helped flesh out her Internet acronym vocabulary. “LOL?” she said, incredulously. “Why not just type, ‘Ha ha ha ha’?” We all vowed to make her a MySpace friend. Jeremiah made a video introducing everyone (including Mapuana). 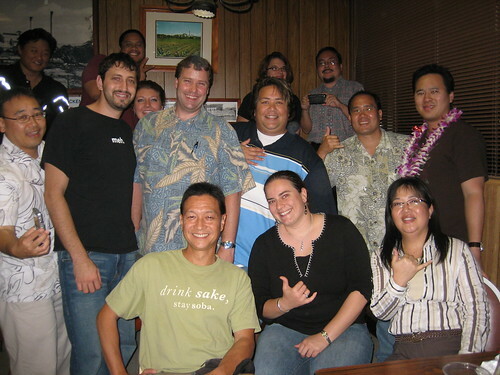 He also and rallied us to post the hashtag “#hawaiiblog” to Twitter and to tag our Flickr photos with “hawaiiblog” so we could find each other online. Ian Kitajima was broadcasting live video from the gathering. And the thoughtful and resourceful Kara Baker ventured out to bring back a flower lei for Jeremiah… and a box of ice cream cones for everyone else. It was a wonderful evening spent with wonderful people, many of whom met in person for the first time (despite knowing each other well online). We wished Jeremiah the best on his well-deserved vacation, and vowed to get together again soon. It was a great time! I was so glad to meet everyone! Thanks for coordinating everything, I had a great time! Previous story The Spam Jam is Coming!